Jane Katherine, portrait of the artist’s Mother. Meet Jane Katherine. She is my Mother. 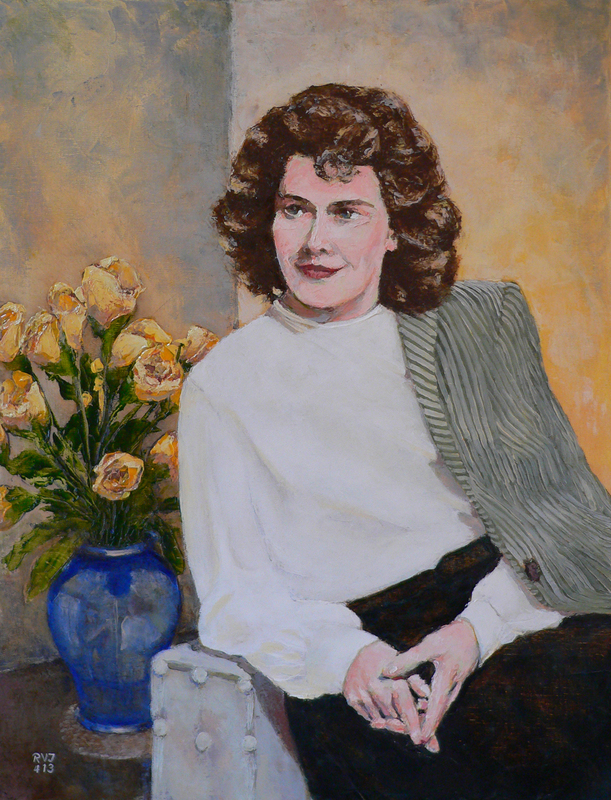 I painted this portrait of her based on a photo taken in 1947. She, at that time, was a tender 18 years of age. This was before her marriage to my Father. Eleven years before I was born. While painting this portrait I had many existential thoughts about her life and mine. (you can see a film of this work being created at: Jane Katherine Continuum) Where was I at this time? Our faiths and cultures often speak of what happens to us after death. Not much talk in western religion or philosophy goes into where is the I before we are born? Did some form of you exist prior to living on this planet? Have you ever considered whether there is a suchness or spirit that lives before or after we are here? I remember learning of the many Catholic doctrines about the after-life as a boy in catechism class but I don’t recall hearing about a pre-life. Millions if not billions of people believe in reincarnation. If you know of other ideas on this subject, enlighten me. This is a Mother’s Day gift from me to my Mother and entire family. I know that Mother’s Day is not for a week or so, but Jane fell last week and broke her arm bad enough to require surgery for repair (I just received word that she is home and recuperating) so I decided to give this painting to her a little early, to cheer her up. Happy Mother’s Day Jane Katherine. Beautiful way to convey the love between parents and children the way it is supposed to be. Our gang was very fortunate to have the parents we were blessed with. Your closing brought a tear to my eye. You have reminded me of a poem I wrote to my mother on her 47th birthday. It implied that I [pre-life] chose her somehow to be my mom. I am a believer of after death spirits or your “suchness or spirit”. I believe to have experienced such but also believe that we need to be open to the idea to truly “see” it. Tina, I’m happy to say that Jane has healed well. She will appreciate your call.